The Early Bird Catches The Worm!!! I received a question about getting started in setting up a little Christmas display for the first time. With Summer just around the corner, it seems like the most inappropriate time to start planning a little Christmas set-up, but actually this is the best time to plan. Before the internet, we had to wait until late Summer for a few catalogs by mail that had some "early bird" Christmas items to get our creative juices flowing. Merchants use the early bird catalog sales to determine what items should be supplied for the upcoming shopping season. We have the power of the Web (have had it for almost 10 years now) to help us with our project planning all year long. Learning to use a search engine like Google to its fullest is a very valuable computer skill. Not just the usual search, but deep searching. And what a wealth of information it provides! Use the names of certain merchandise for your search including the manufacturer's name if you have it. Auction sites usually turn up in the results, and they may have some good information about certain items, or yield other search terms. Save photos and URLs of everything you like. For example, you like the Rudolph special from about 1964 and want to do a small set-up for a coffee table in your home with these figures. So search for "Rudolph figures" and you'll get some good results, but you'll find, in the off-season, most of the popular stuff offered is already sold-out, but might be on eBay. Be sure that you buy items in a particular scale or size range. All the figures won't look correct together since there are about 2 different sizes available. So determine what size you would like. Some of the approximately 2-3 inch tall pieces are nice and work well with trains, but 4-5 inch tall sizes are also available, so study the descriptions to see just how big they are. Nothing is more disappointing than buying a figure that is visually incompatible with the others. When buying things on eBay or on any online store, along with the regular precautions, be sure to research the prices. Now the most important thing: check the new offerings for the upcoming year. These figures improve all the time and the manufactures respond to customer demand. So research and search, all the time. Fortunately for certain collectibles, Time and Space Toys offers practically every Rudolph and Charlie Brown Christmas item currently manufactured, and they also show what has sold-out. Buy early because the popular stuff sells out quickly. Then use the power of the Web to see how people like me set up these items in their home. Don't narrow your search to a particular figure line. See how others use, for example, the Precious Moments figures in their homes in a Christmas display. Then the concept can be adapted to your collectible figures. Again, a deep search of the Web will give you the best information. Just be patient online while searching, especially patient with dial-up! Don't be afraid to replicate an idea you see on the Web. Use it like a formula for success! Now for the train, if you would like to add one. This can be an easy decision if you already have some equipment that you like, so just buy whatever you need to complete the set-up (more track or cars), and start playing around with a basic arrangement of an oval of track. In my opinion, you can go in 2 directions, both approximately "O" scale. One would be the traditional 3 rail O gauge product typically known as "Lionel" (but there are other manufacturers), the other is narrow gauge O called "On30." I would recommend 3 rail O27 that can be set up in the smallest space (an oval of 3 rail O27 tubular track can be set up on a 36" by 27" board that rests upon a table top, buffet, or coffee table of a smaller dimension). a couple of short cars including a caboose, an oval of O27 track, and a small AC transformer. (These 2 locomotives pictured above can be found for under $90 each in 2009.) You probably can bring in the whole project for less than a starter train set if you shop carefully. The siding will just about hold the short train, but this set-up can accommodate 2 short trains (while one is stopped on the siding) with a little special wiring. Use a non-derailing turnout/switch if possible. If you use an unmodified handcar, remember that you can't back it off of the siding, but running it on the "main line" is great fun! To modify a handcar for forward and reverse operation, here is my article with full instructions, Halt Lionel Handcar Hang-ups! from CTT in October 2005, offered now as a free sample from Kalmbach Publishing and Classic Toy Trains. If used around children, frame the board to prevent the train from falling to the floor after a mishap, but check the train clearances first, especially on the curves. It may be necessary to slightly enlarge the board's dimensions. For the best viewing of a small set-up, keep frame height to about 2" tall, higher if necessary. Above is a quick reference of O27 tubular 3 rail track suggested for this simple set-up. This type of track is a good choice for a beginner who would like to experiment with different track plans, in the smallest space, spending the least amount of money. All 3 rail track offers certain advantages over 2 rail track, and this track has that traditional 3 rail look often associated with toy trains. More realistic-looking sectional track is available with built-in roadbed, however it requires more space because the minimum diameter is larger than 27 inches. Flexible track is available for those who would like to make their own curves. I use GarGraves flexible track in less than 24 inch diameter curves with the train pictured above. Of course, I love the Lionel handcars and would recommend that you consider the handcars for your small display. The handcars aren't inexpensive compared to the price of a small locomotive, but there wouldn't be a need to buy any rollingstock (cars) at first. But get to a hobby shop and check out what is available before you finalize your decision. Nothing like seeing these things in person. Ask questions and avoid the impulse purchase. Handcars are great, but they are temperamental, only travel in the forward direction (without modification), and may not give you the correct sense of how robust the 3 rail O gauge product can be. Most 3 rail products are quite easy to operate and maintain, perhaps the easiest of all hobby and model railroad train products, making them a perfect choice for a beginner or seasonal hobbyist. 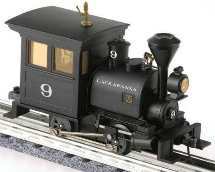 In most cases, a 3 rail O gauge starter train set is a good choice. So use the power of the Web to its fullest, and you'll save yourself time and money, and get a wealth of ideas! And remember the early bird catches the worm! But there will always be another sale and new products to choose from!